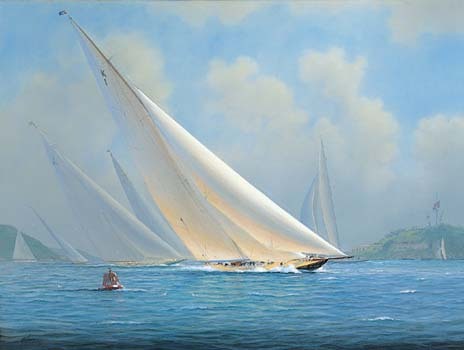 America's Cup, J-Class and Big Class subjects by one of the most accomplished contemporary British maritime painters. Signed open edition and limited edition prints. Born in Hull, England in 1951, Tim spent his childhood from the age of five in the Channel Islands, where his interest in the sea and sailing first developed. He now lives in Saltash, Cornwall in the UK, with his wife Sharon and his daughters Holly and Gemma. 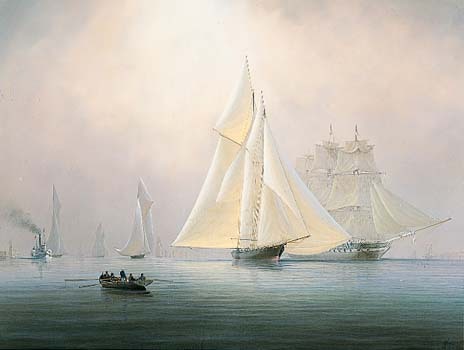 Tim began his painting career when he was 27 and established his reputation with nautical paintings of subjects from the ships of Drake's era, through to modern racing yachts. He is renowned for his meticulous attention to detail and his ability to create dramatic and atmospheric images. Tim's paintings are represented in collections world-wide, including those of Ted Turner, Bill Koch, The Shah of Oman, David Rosow, Ranulf Rayner, Sterling Morton Hamill, Les Trois Rois Hotel - Basel, Karl Wissing, Graham Blease and Dennis Conner. His work has been exhibited throughout Europe, and in Nantucket, Connecticut, Mystic Seaport, Washington DC and Boston.